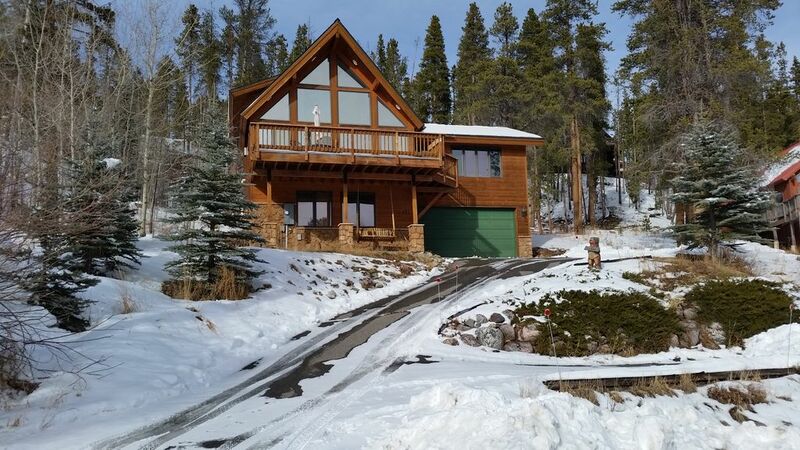 This charming Peak 7 home has the most spectacular ski area and mountain views! Hidden in the mountains with a perfect, quiet and private location that is only 3 minutes to the ski slopes and 6 minutes to Main Street Breckenridge. You'll be in the mountains but you'll also be close to everything! You'll stay in a beautiful modern Mountain Getaway with over 2400 square feet, 4 spacious bedrooms and 3 bathrooms that can house the whole gang! Sleeps 8 in beds and 3 more in sofa-beds for a total of 11. Main level has an open layout w/hardwood floors in the spacious kitchen and dining areas. The kitchen has acres of counter space with built in seating. The dining room has beautiful views of Mount Baldy. Next to the kitchen and dining room you'll find a wonderful family room with soaring vaulted ceilings and a huge wall of windows overlooking Breckenridge ski area and Mount Baldy. There are mountain views from all rooms except two of the bedrooms (these two have forest views). The modern cabin stands three stories tall among pine trees in a picturesque setting. Free High Speed WiFi to keep up with the world and entertain your family. Bring your spirit of adventure to enjoy the Rocky Mountains and Breckenridge! * Check our Calendar for availability. * You must be over 25 years old to rent. * After you agree to rent we will send you a Rental Agreement. * Check in is 3:00 p.m.; checkout is 10:00 a.m.
Beautiful mountain, ski slopes and forest views! You will LOVE to daydream overlooking the Rocky Mountains!!! Modern, very roomy, lots of counters, large eat-in area AND open to dining and family rooms WITH beautiful mountain and forest views! Great Deck- a wonderful spot to take in the views and relax!